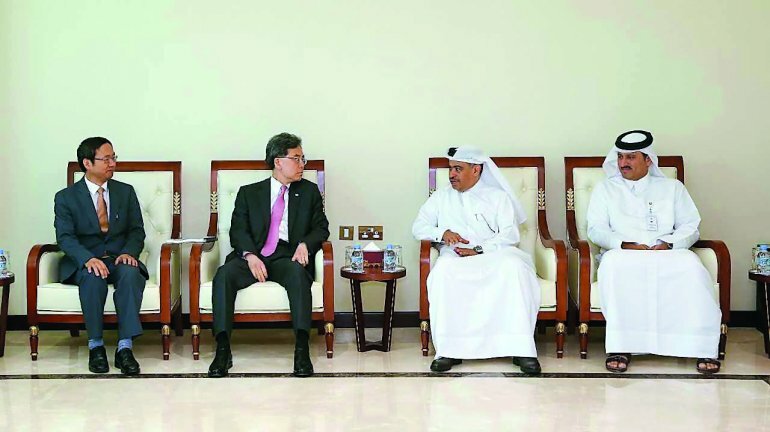 Minister of Commerce and Industry H E Ali bin Ahmed Al Kuwari yesterday met with Kim Hyun-Chong, Minister for Trade, Republic of South Korea, who is currently visiting the country. The meeting reviewed bilateral relations, and joint cooperation especially in the trade, investment and industry fields, as well as ways to boost and develop them in light of the friendly relations between the two countries. They also highlighted the developments of the Qatari economy during recent years and reviewed investment opportunities in all sectors, as well as the legislation adopted by the State and the initiatives launched in an aim to support the private sector, which would increase foreign direct investment and attract more Korean companies to the Qatari market. In addition, they discussed mechanisms to support joint investments and to stimulate the private sector to establish innovative investment projects in the main sectors that would serve the economic trends of both countries.